Three members of Congress have been named co-chairs of the Cloud Computing Caucus Advisory Group, the organization supporting congressional efforts to boost cloud computing initiatives throughout the Federal government. Representatives Barbara Comstock (R-Va.), Ted Lieu (D-Calif.), and Mark Walker (R-NC) join founding co-chair Gerry Connolly (D-Va.) on the advisory group. Their participation in the Cloud Computing Caucus Advisory Group coincides with an increasing amount of congressional interest in cloud computing as a means of improving Federal IT and saving money. The Federal government will spend an estimated $80 billion on information technology this year, and the Caucus Advisory Group’s annual State of Federal Cloud report pegs cloud adoption at about 1 percent of that Federal $80 billion IT spend. In addition to saving money, cloud computing can improve cyber security, Rep. Walker said. “This caucus focuses on drawing attention to all that cloud IT can do for our Federal networks. 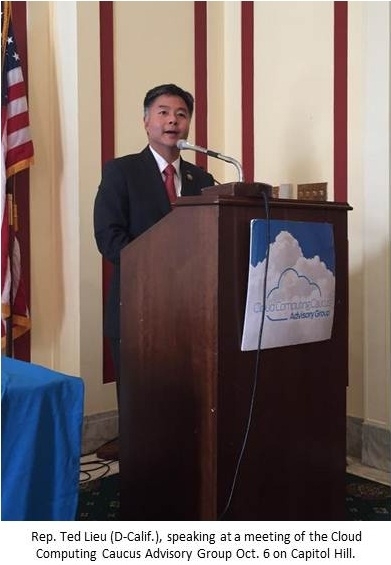 In light of the recent Office of Personnel Management hack and subsequent theft of personal data, this caucus will play an increasingly vital role in raising awareness and offering sound and secure solutions for the adoption of cloud IT across the Federal government,” he said. Cyber security was the focus last week of the Cloud Computing Caucus Advisory Group’s meeting last week.